Due to reconstruction of the second part of the station, the platform of the metro line A for the direction to Nemocnice Motol in the Muzeum station will be closed from Wednesday, the 3rd of January 2018 (from the launch of daytime operation) to May 2018. Trains in this direction pass through the station. For a ride to the Muzeum station in the direction from Depo Hostivař, it is necessary to travel up to the Můstek station and subsequently change to a train in the opposite direction. 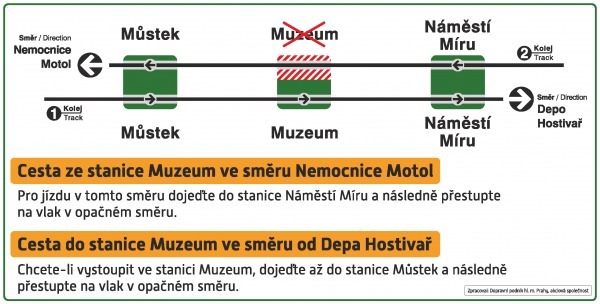 For departure from the Muzeum station in the direction to Nemocnice Motol, it is possible to use a train in the direction to Depo Hostivař and change in the Náměstí Míru station to a train in the opposite direction. Passengers will be informed about the change by station radio, on line A in the carriages by train radio as well as by ceiling panels, in both Czech and English language. Several types of informational leaflets will be issued. The leaflets will be available in the informational showcases in the metro stations as well as in vestibules of the metro stations impacted by the restriction. For the period of the suspension, information boards with a schematic diagram and basic information in Czech and English language will be on the wall in the station. In the first days of the restriction information clerks in reflective vests will be available on the spot, ready to advise passengers in Czech and English language.